Nicola Sturgeon is a Scottish politician. She has been First Minister of Scotland, since 20 November, 2014, and Leader of the Scottish National Party, since 14 November, 2014. 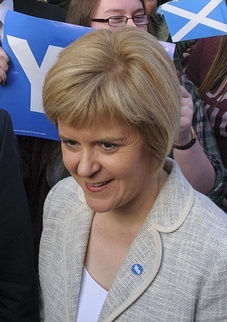 She was previously Deputy First Minister of Scotland, from 17 May, 2007 to 19 November, 2014, among other duties. Nicola is the daughter of Joan Kerr (Ferguson) and Robert Sturgeon. She is married to Peter Murrell, who is the chief executive of the Scottish National Party. Nicola’s paternal grandparents were Robert Sturgeon and Margaret Mill (the daughter of Joseph Mill). Margaret was born in Ryhope, Sunderland, England. She is an embarrassment to Scotland.